Hello everyone! I'm new to the forum and to making DIY modules and hope someone can help. 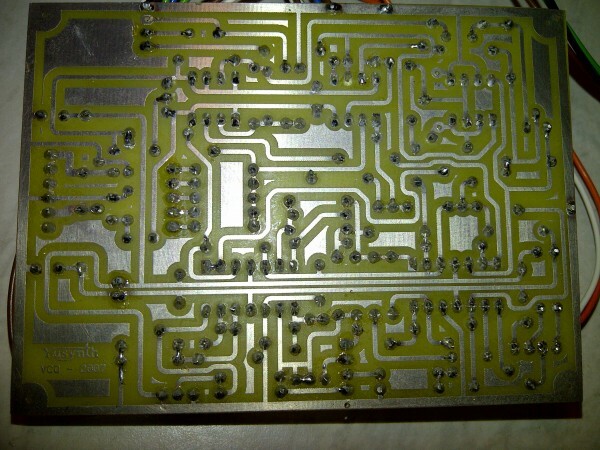 I've built a YuSynth VCO (the SSM2210 version). It mostly seems to work fine, I have good wave shapes, I've not adjusted the tracking or tuning yet as I need to buy a tuner. The frequency is a little unstable however, it does seem to vary a bit if I leave it on for a while. I'm not too worried about this for now but may be a pain later on. The main concern I have (and may be related to the unstable frequency) is that when I plug the power in, the input voltage changes from +15V -15V to +15V -29V. The power supply unplugged gives a normal +15V -15V and is stable, it's only when I power the module I get -29V. 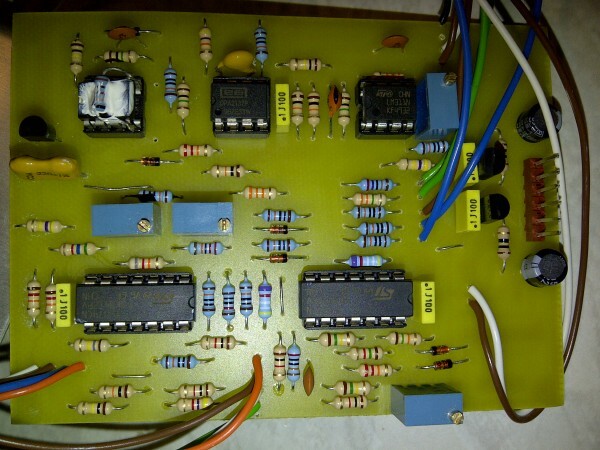 I had the same issue in the first VCO I built, but I put this down to me using incorrect components and thought I'd blown something so started again after a few days of troubleshooting. If you're saying (and I think you are) that your negative supply is changing from -15 to -29, then you've definitely got a problem. I would certainly not recommend plugging anything into the supply until you get this worked out. It's not clear to me whether this is actually a power supply issue, or if you're doing something that makes the measurement inaccurate. There is no way the VCO should be able to make your supply go to -29Volts though. Ideally it would be good to get some low value high-wattage resistors and hang them on the power lines to load test your supply. BTW - I think that several of your links are duplicates. I didn't see any pictures showing -29V, and several of the pictures are the same. I've fixed the links now to show the correct images, thanks! did you check the regulators? 78L15 and 79L15 are on the right place? maybe there is some shorts between the +/GND/- rails. ok...I'm starting to think the power supply I'm using is inadequate and is causing problems on the negative rail. Can anyone recommend a good power supply? I'm looking at a supply system from Synthersizers.com but seems a bit pricey at £210 before shipping costs from the US. Can you post a detailed view of your power-supply and how the the various poles of the PSU are connected together ? Is the positive pole of the negative supply (back) is connected to the negative pole of the other (front). I've connected the + rail of the negative supply to the - of the positive supply as seen in the pic below. I've been lead to believe this 0V rail needs to be earthed...is this correct? As seen in the other pics, I've done this by connecting this 0V rail the mains plug earth...is this correct also? I realise this -29V problem only occurs when my oscilloscope is attached. So I took my VCO out of the equation. When the earth from my oscilloscope is connected to the earth of my power supply, I get the -29V!?! So i figured the 0V rail is not earthed correctly. So I left 0V rail earthed to my power supply and adjusted the pot on my power supply to get -15V....then I got smoke, bad smells coming from the - supply. I know this problem is now outside the remit of your VCO design, so any further help is very much appreciated. Maybe I should pay now for a long term power supply solution? Underside of power supply. Please note the internal connection joining the + of the negative rail to the - of the positive rail. That's what I suspected the two PSU are independent you must interconnect them to define the 0V reference. On your PSU you have one output labelled+ that you left free. 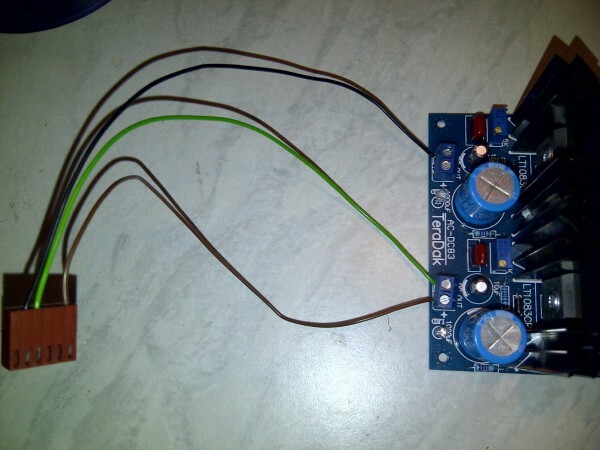 You must connect it to the 0V of the modules that is connect it to the point where is attached the green wire (0V of the other PSU line). I've already done the internal connection. I've highlighted this now on the picture above. I'm just not sure if I've earthed this point correctly. p.s. do you think this supply and transformer is suitable? Do you have any suggestions for a good power supply for around 22 modules? max load 3VA per winding! 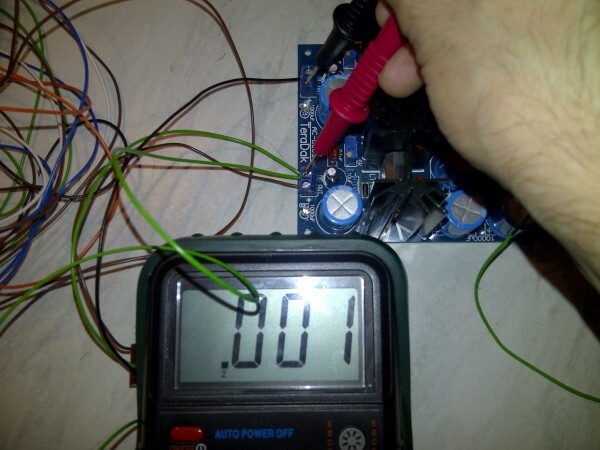 if its true than this PSU really small to drive 20 modules. this toroid would be good for drive more than 20 modules. You'd did it but have you checked with an ohm-meter (at power off) that they are actually connected ? You should measure 0 ohm between the two expected common poles. 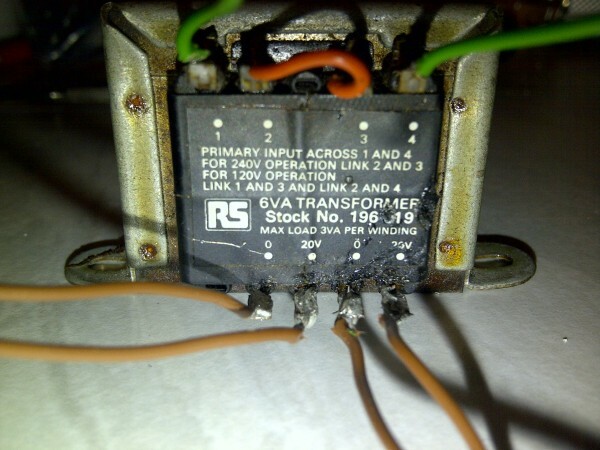 Concerning the power of the transformer it is certainly too small, you need at least a 2x18V 26VA for 22 modules. Yves...excel sheet is very handy, thanks very much. 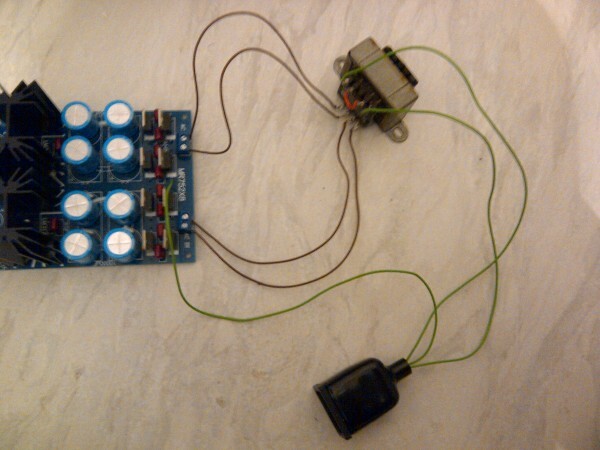 Yes the transformer is small, I was just using this setup to build and test individual modules. I've tested the connectivity between the two rails incase of a dry joint, but it they're definitely connected. PickNick...thanks for the link this is really helpful and cheap too!! 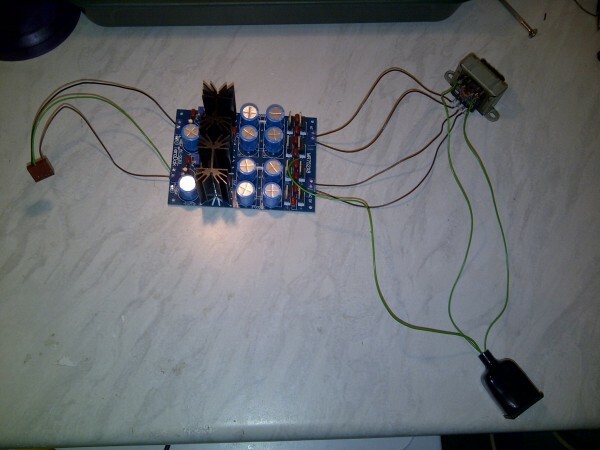 Do you have any further suggestions for a suitable +15V -15V power supply to go with this? Showing a diode test between the two rails...what you can't hear here is the beeping noise! 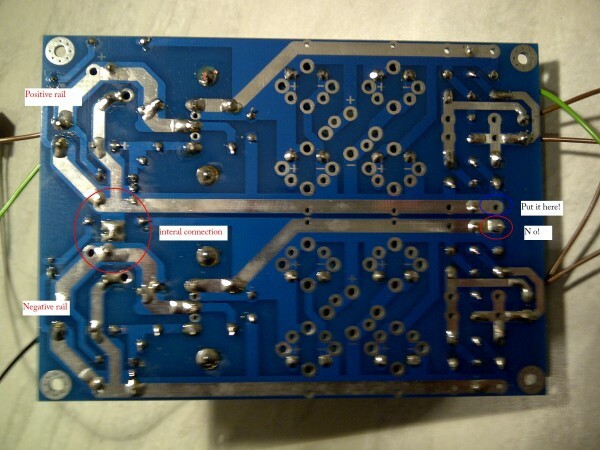 May be the regulator of your negative PSU is dead... replace it if you have a spare part. Maybe...at least I know my board is good, so I guess I'll move on to looking for a more permanent power supply as I'm starting to build the case soon. Any suggestions Yves? I don't know if you'd be comfortable doing this, but I just went on Ebay and bought a surplus supply. There are lots of them floating around. If you would like to have a 'bench' supply to test individual modules, musicfromouterspace has some nice inexpensive options. Thanks, just had a quick look but couldn't see any. What should I search for? Thanks for all your help and responses, I've found the issue with this supply. The 0V rail on the power supply was not earthed. Not only that but the negative regulator was earthed instead. There are two rails next to each other that I thought were joined and a hole in each rail that I thought I could take my pick to put the earth wire in. No! Not the case. They were not joined and i earthed the wrong rail. I will highlight the picture showing the underside of the supply. On the right, I've circled the incorrect place for the earth wire in red and circle where it needed to go in blue. I little embarrassed? Yes. Deterred? No. This is not the first and won't be the last mistake I make during this project. I'm glad to see that can-do attitude. With this kind of a hobby you really need it. The other day I was talking to a friend about this whole synth-building experience. I told him "I learn a little something from every mistake I make. I just don't know how much more knowledge I can afford"
Regarding Ebay - I think I just used "power supply dual 15V". I just checked and found a few candidate here in the US. There's a company called Meanwell that seems to be pretty popular out there, and of course Power-one makes good stuff.